A guest post by Dr Nicky Nielsen, newly-appointed Lecturer in Egyptology at the University of Manchester. Senebtifi’s vessel is one of several objects which are used in the teaching of the University of Manchester Online Egyptology Certificate and Diploma courses. The ink used to write this dedication has faded considerably and the last few syllables of the owner’s name are too faint to read. However, a clue to his identity can be found in the original archaeological context of the beaker. It was found by the Lancashire-born Egyptologist John Garstang in 1906 at the site of Abydos, home to the cult of Osiris for much of Pharaonic history. The beaker was found in Tomb 7 A’06 by Garstang along with several other inscribed vessels. These vessels were in the form of model granaries, which were believed to magically transform into real granaries in the Afterlife, thus ensuring a rich supply of grain for the deceased owner. Three of these model granaries (Manchester Museum 3972, Garstang Museum of Archaeology E. 6846 and Bolton Museum Bol.A.10.20.10) were inscribed with a similar offering formula and all three list their owner as the Officer of the Ruler’s Crew, Senebtifi. Senebtifi’s title is somewhat mysterious. It was used primarily during the late Middle Kingdom and throughout the Second Intermediate Period. It may have been related to Egypt’s growing military and in particular to the riverine navy built by the Theban rulers of Egypt during the Second Intermediate Period and deployed in battle against the Hyksos city of Avaris at the end of the Second Intermediate Period (c. 1550 BC). The writing style of the inscription is also noteworthy. For the first part of the inscription, the so-called Offering Formula, the scribe has used a more formalised hieroglyphic writing, attempting to form the individual symbols properly. 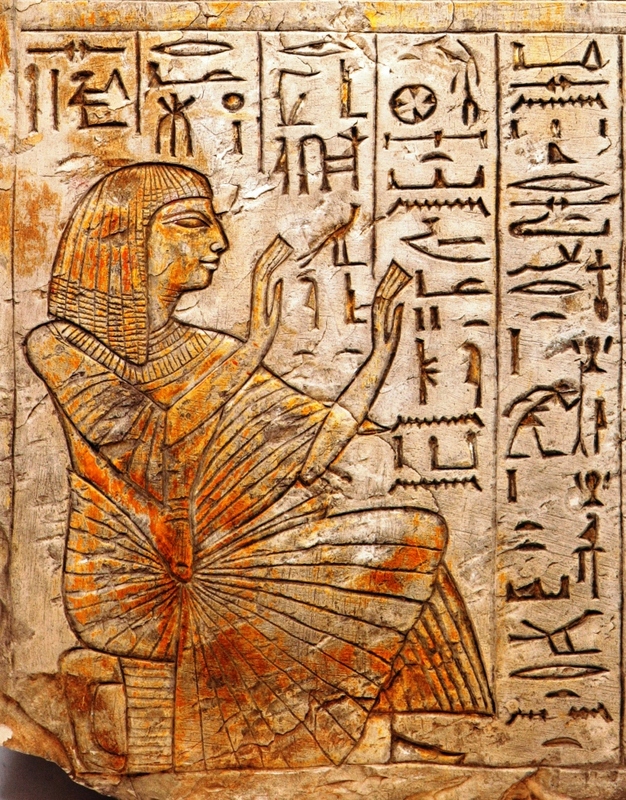 However, in the second part of the inscription, which lists Senebtifi’s name and title, the scribe has reverted to using hieratic, a cursive version of hieroglyphs more commonly used for writing administrative documents. This may suggest that the vessel was purchased (or more precisely, bartered) with the formulaic part of the inscription already written and that the new owner’s name was added in a hurry by a different scribe who was more comfortable writing in hieratic. Another example of an off-the-shelf object! The Great Royal Wife, she made (it) as her dedication for her ‘brother’, her beloved, the perfect god, Neb-maat-re. 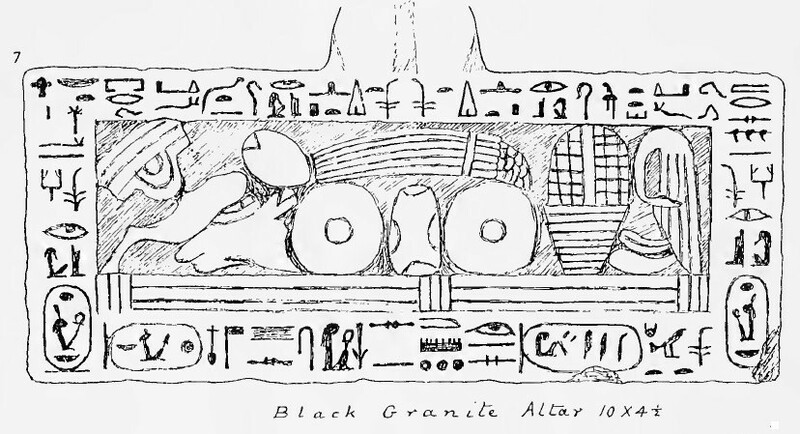 Petrie noted the importance of the piece when reviewing the inscribed finds from Gurob: “The black granite altar is of special interest. Though roughly cut it seems to have belonged to a class of funerary offerings made for Amenhotep III by his celebrated queen Thii. It follows the usual formulae to Osiris, for the royal ka of Amenhotep III, down each side ; and then along the base is a line stating that ” The great royal wife Thii made her monuments of her brother, her beloved, the good god Ra-ma-neb.’ The question of the parentage of Thii is one of the most important genealogies in Egyptian history. Petrie’s interest focussed on the use of the Egyptian term ‘sen’, which implies kinship but is often rendered ‘brother’. In fact, Tiye’s statement need not mean that she was the sister of Amenhotep III; a more general sense of kinship may be meant (the word “husband” – written with a phallus sign – may have been inappropriate), and the affectionate sentiment of wife towards her spouse is appealing. The fact that the offering table exists at all and the reference to the king as ‘the Osiris’ implies that Amenhotep III had died when this object was made and used. The appearance of the term ‘royal ka’ (ka nesu) is also fairly uncommon, and refers to an important (semi-)divine aspect of the king’s person, which could be separated from him and objectified for worship. Although Amenhotep III promoted his own divinity to an unusual extent during his own lifetime, it seems more likely that the ‘royal ka’ mentioned here is that of the deceased king. This finely carved limestone stela (60.5cm in height) comes from the Ramesseum, the mortuary temple of King Ramesses II. The stela was dedicated by an important man named Ramose, who held the title of Senior Scribe in the workmen’s village of Deir el-Medina during the reign of Ramesses II (c. 1279-1213 BC). Ramose is known from over 40 individual monuments from the Theban area. According to accounts on ostraca, he was appointed by the Vizier Paser as Scribe of the Tomb in year 5 of Ramesses II – a role in which he served until at least year 38 of that king. His position afforded him the opportunity to commemorate himself in a range of monuments. The large number may have been motivated by the desire of Ramose and his wife for a child; the couple eventually adopted a son called Kenhirkhopeshef – a scribe well-known to Egyptologists as a keen collector of papyri. Ramose might also have received an income from outside the Village, and his association with the cult of Ramesses II seems to have made him particularly prominent amongst the workmen. In the Manchester stela, Ramose addresses Ptah, the ‘patron’ god of craftsmen, and his daughter Maat, the personification of cosmic justice. Purity, purity for your Kas, in every good thing. Giving praise to Ptah, lord of Truth, king of the Two Lands, with beautiful [face], [who is on] his great throne, lord of destiny, who creates fortune, who sustains the two lands with his crafts, and kissing the earth for Maat, daughter of Re, mistress of the sky, mistress(?) of all the gods, eye of Ra, who is before him, with beautiful face, who is in the barque-of-millions, lady of the Estate of Amun, so that they may give a good burial after old age in the Theban necropolis, the district of the Two Truths, for the Ka of the Osiris, true scribe in the Place of Truth, Ramose, justified. The original context of this stela is not clear. It may have been moved to the Ramesseum long after Ramose’s death. Interestingly, however, Quibell recorded finding parts of the nearby temple of Tuthmose IV reused in the Ramesseum; Ramose appears to have held an important position in the mortuary temple of Tuthmose IV prior to becoming Senior Scribe at Deir el-Medina – implying that building material was perhaps already being taken from the temple of Tuthmose IV whilst there was still an active cult there. Ramesses II is certainly well-known as a recycler of the monuments of his ancestors; the creation of his own “temple of millions of years” seems to have sealed the fate of others. The reading of this text has benefited greatly from the suggestions of Angela McDonald, and is based on a new annotated translation by Mark-Jan Nederhof. 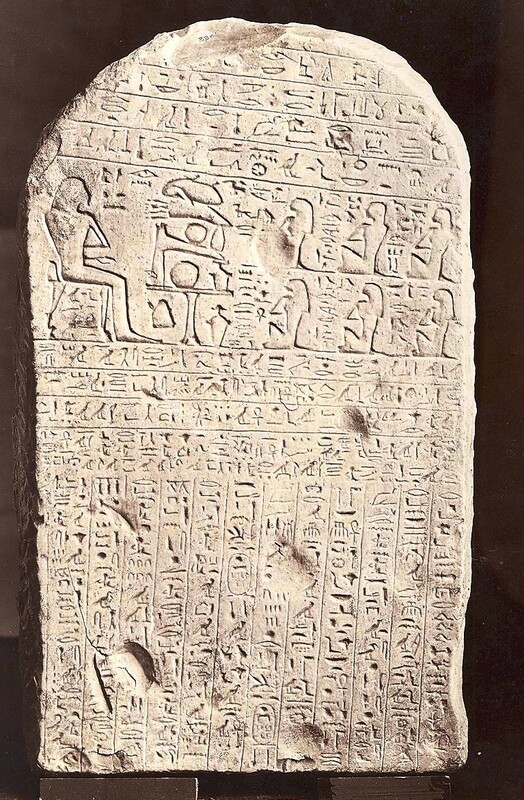 “In the stela of Sebek-khu the Manchester Museum possesses one of the most important historical documents ever found in Egypt.” So wrote Thomas Eric Peet, exactly 100 years ago, about this rather crudely executed, 28cm-high limestone stela (Acc. No. 3306). It was discovered at the site of Abydos by John Garstang in 1901, excavating for the Egyptian Research Account. It once stood among a mass of such private monuments on the “Terrace of the Great God” at Abydos, a site sacred to the god Osiris, and enabled the owner – as the inscription makes clear – to enjoy the smell of incense from rituals conducted for Osiris nearby. An offering which the king gives to Osiris, Lord of Abydos [that he may give an invocation offering of bread and beer], oxen and fowl, linen and clothing, incense and oil, every good and pure thing for the Ka-spirit of the member of the elite, governor, who says good things, repeated what was desired during the course of every day, great district official of the town, Khu-Sobek whose good name is Djaa, born of Ita of the district of Tefnut, possessor of honour. His daughter, his beloved, Gebu, born of … His brother, Dedu, born of Meret-iti-es. Overseer of the chamber, Kheru, born of Khaseti. The nurse of his heart, Renef-ankh, born of [Dedi]. Iubu, born of Meret-iti-es. Nebet-Iunet, born of Iubu. His Majesty went downstream to overthrow the Bedouins of Asia. His Majesty arrived at the district named Sekmem. His Majesty was making a good start to return to the palace, (when) the Sekmem and the wretched Retjenu fell (upon him?) (while) I was serving at the rear of the army. Then the soldiers of the army went to fight with the Asiatics. I struck an Asiatic, and I had his weapons taken by two soldiers of the army without ceasing fighting; I was brave, I did not turn my back to the Asiatic. As Senwosret lives for me, I have spoken the truth! Then he gave me a throw-stick of electrum, into my hand, a sheath and a dagger worked with electrum together with handle. Member of the elite, governor, firm of sandal, easy of stride, loyal (lit. one who adheres to the path) to the one who advances him, one to whom the Lord of the Two Lands gave his splendour, one whose position his love promoted, the great district official of the town, Djaa. He says: I have made for myself this memorial, beautified, once its position had been efficiently established at the terrace of the great god, lord of life, foremost in the district “Mistress of Offerings” and in the district “Mistress of Life,”(so that) I may smell the incense that comes forth, (and) I may be provided with the divine censing, the great district official, Djaa. He says: I was born in year 27 during the reign of the King of Upper and Lower Egypt Nebkaura (Amenemhat II), justified. When the Majesty of the King of Upper and Lower Egypt Khakaura (Senwosret III), justified, wearing (lit. in) the double crown arose upon the Horus throne of the living, His Majesty made me adopt the profession of a weapon trainer (lit. fighter of stick) beside His Majesty along with six men of the Residence. I have become effective at his side, and His Majesty caused that I be appointed to be a “Follower of the Ruler.” Sixty men have been given to me. His Majesty went upstream to overthrow the desert Nubians. Then I struck a Nubian [at Kenekef] in the presence of my townsmen. Then I went downstream in attendance (lit. following) with six men of the Residence. Then he appointed me “Inspector of the Followers.” One hundred men have been given to me as a reward. Sobek-khu describes military campaigns into the ancient Near East which, before the discovery of the stela, were little known. 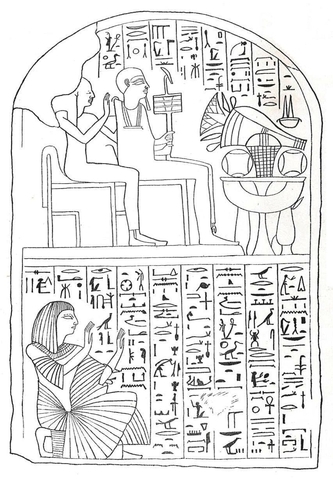 As is typical of such autobiographical inscriptions, the protagonist emphasises his talent and promotion through the ranks by Pharaoh because of this. The real importance of this inscription lies in the references to armed combat in the area of Retjenu and Nubia. The soldier is “rewarded” with – or perhaps he simply helped himself to? – the weapons of his defeated foe. This type of autobiographical account – emphasising military prowess – became more common later in Egyptian history, but stands out at this period as something of an innovation. 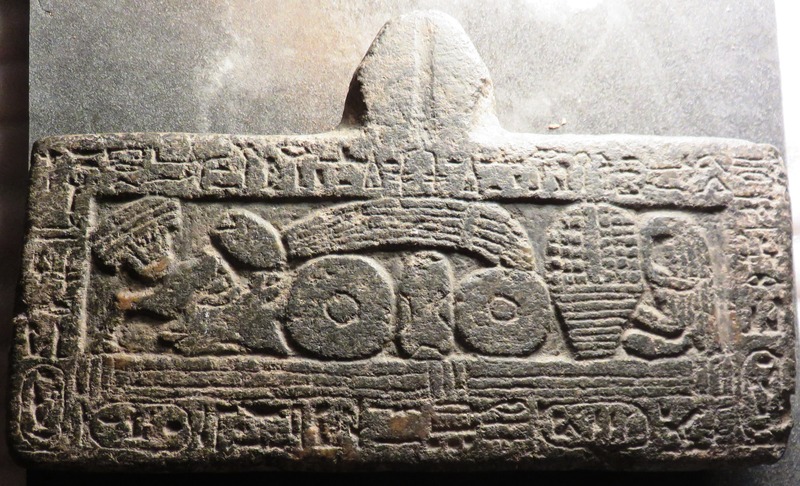 We know from another inscription from Semna that this same Sobek-khu was still active in the ninth year of Amenemhat III, when he would have been aged at least 60. Little did Peet, the editor of the text and a frequent visitor to the Manchester Museum collection, realise that as he wrote about these ancient conflicts in early 1914, Europe was on the brink of the Great War. Sobek-khu lived to tell his tale but, as in all conflict, many others did not. 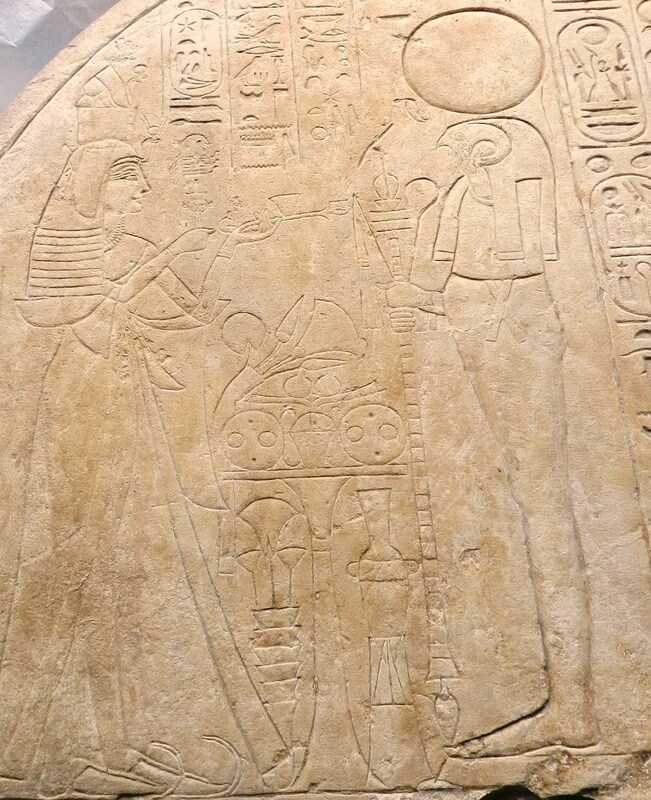 This finely wrought limestone slab likely once formed the upper part (the curved ‘lunette’) of a larger stela commemorating the daughter of King Ramesses VI (c. 1143-1136 BC), a princess named Iset – or Isis. The stela was excavated by Flinders Petrie at the site of Coptos. The Osiris, King, Lord of the Two Lands, Neb-Maat-Re Mery-Amun, Son of Re, Ramesses, Heka-Iunu, Father of the God’s Wife of Amun, The Divine Adoratrice Isis. Re-Horakhty, by whose shining all is illuminated, Great God, Ruler of Eternity. I play the sistrum before your fair face, gold is in front of you. May you allow [me] to see the sunrise, the Osiris, the Hereditary Princess, great of favours, the God’s Wife of Amun, the King’s Daughter, the God’s Adoratrice Isis, true of voice. Her mother, the Great Royal Wife, whom he loves, the Lady of the Two Lands, Nub-khesbed, true of voice. Making a libation to Osiris, Lord of Eternity. May you allow me to receive offerings that go out upon your offering tables, consisting of everything good and pure for the Osiris, the God’s Wife of Amun, the King’s Daughter, Lady of the Two Lands, the Divine Adoratrice, Isis, true of voice. Her father, the king, Lord of the Two Lands, Neb-Maat-Re Mery-Amun, Son of Re, Ramesses, Heka-Iunu […]. 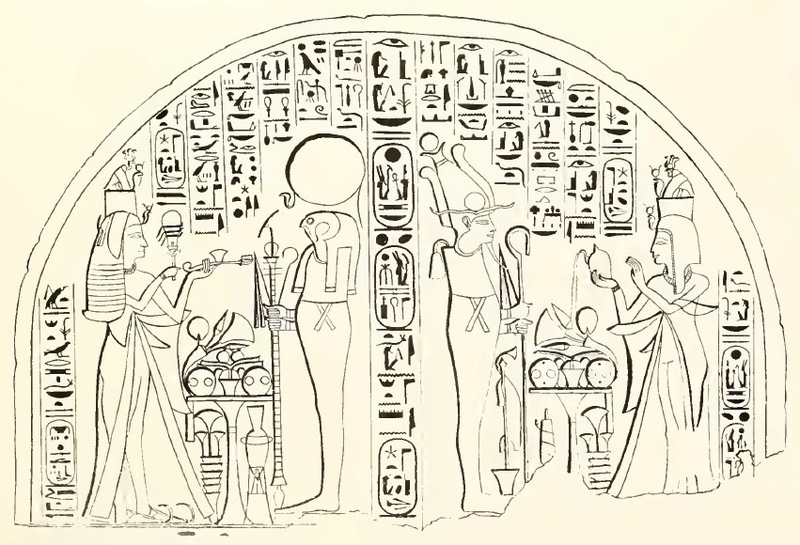 The scene makes an important religious statement, showing two deities as different aspects of the sun god – representing both night (Osiris) and day (Re-Horakhty). As is typical of many such scenes, the text captions and reinforces what is depicted in figural scenes. Isis performs rituals with a rattle, or sistrum, burns incense and pours libations. These were important aspects of the role of the ‘God’s Wife’, as chief ritualist who entertained the god. In some sense, the ‘God’s Wife’ (or ‘God’s Adoratice’ or ‘God’s Hand’) was a sexual companion for the god Amun. This position was an important religious and political one, because the princess was a representative of her father the king at Karnak – when the Pharaoh was largely based in the Delta at this period. From recent excavations of chapels at Dra Abu el-Naga on the West Bank at Thebes, it seems the office of God’s Wife and of High Priest were closely linked at this time. The stela’s inscription is important in making explicit the parentage of Isis, which has been used by Egyptologists to help build a picture of royal family relationships in the Twentieth Dynasty. While this small limestone plinth(?) may not compare with the much better-known Abydos Kings List at Seti I’s temple, its short inscription nonetheless conveys a depth of feeling about – and understanding of – the past. Unlike more extensive king lists this modest monument records the names of three Eighteenth Dynasty pharaohs: Ahmose, Amenhotep I and Tuthmose III. One side names ‘The good god, Neb-pehty-re, beloved of Osiris.‘ This reference to Ahmose as beloved of the god Osiris is appropriate for Abydos, the god’s main cult centre. Ahmose was responsible for a significant temple to the god at the site, fragments of relief from which are in Manchester. On another side is inscribed the name of Ahmose’s son, Amenhotep I: ‘The King of Upper and Lower Egypt, Djeser-ka-re, given life’ and another names ‘The good god, Men-kheper-re’ – the ‘Napoleon’ of ancient Egypt, Tuthmose III – but appears to go on to name ‘Neb-[pehty? ]-re’ again, this time without a cartouche. This is a rather crudely executed piece and it is unclear what sort of monument it came from, if not a self-standing plinth or support itself. Yet the text asserts personal piety by naming – and thus reifying the memory of – great kings of the past. In this regard it may be guessed that the creation of this object lies in the Ramesside period, the age of the display of overt religiosity by private individuals in particular, and a time of pronounced enquiry into the past. The choice of kings is interesting, especially if these were the only ones named on the whole monument. These men are ‘famous’ kings: the re-unifier and expeller of the Hyksos, Ahmose; the venerated founder the workmens’ village of Deir el-Medina, Amenhotep I; and the great military leader, Tuthmose III. These are the same kings that dominate the history of the earlier Eighteenth Dynasty for Egyptologists today. 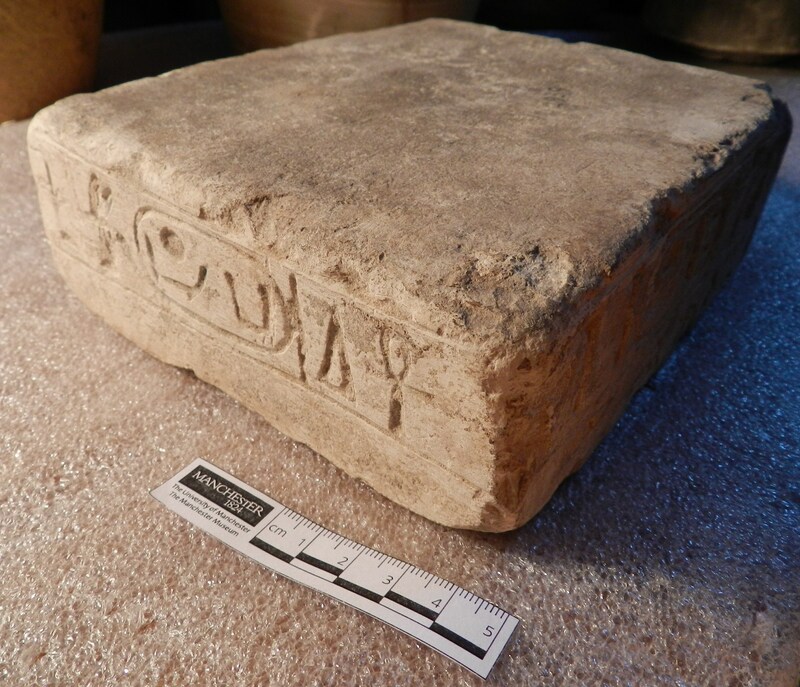 It is significant that this piece comes from the sacred site of Abydos, a site with a long history of building activity, where standing monuments built by each of the named kings could have stood. A recent visit to Manchester by Prof Rainer Hannig, who is preparing his next Handwörterbuch, of New Kingdom texts, served to highlight the many overlooked or mis-transcribed texts in museums all round the world. There are plenty of texts left which we hope will reveal their secrets soon! Stela Acc. no. 4588. Photo by Paul Cliff. This limestone stela is a unique record of some very interesting people who lived during the Ramesside Period. It was discovered near the Ramesseum in 1896 by Flinders Petrie, working on behalf of the Egyptian Research Account. 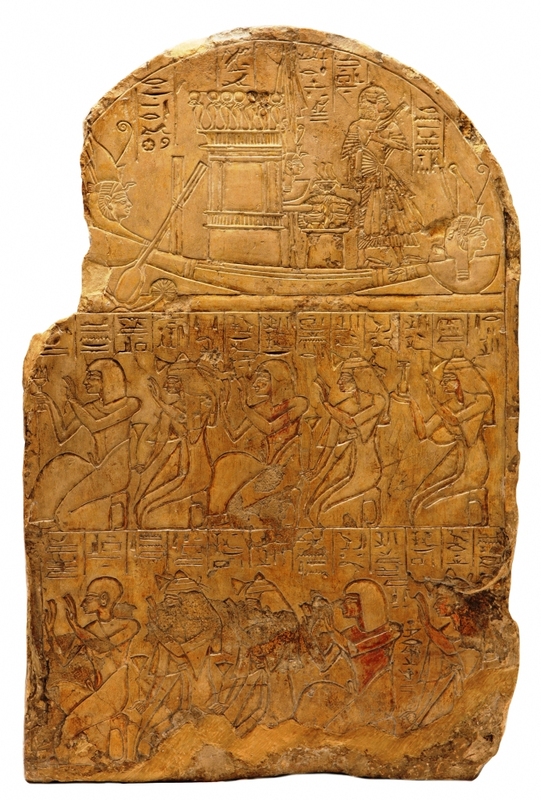 Many of the individuals who are represented on the stela are known from Deir el-Medina, the New Kingdom community of workers on Theban royal tombs. 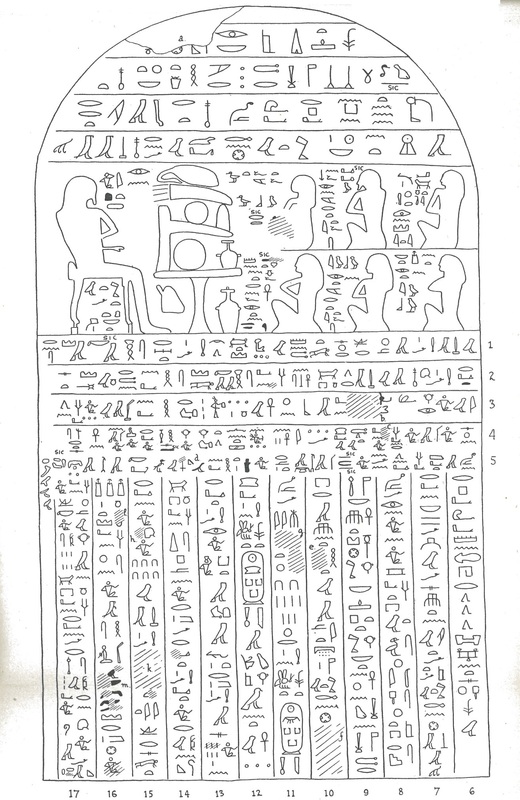 The top register in the round part of the stela (the ‘lunette’) shows Neferhotep, the foreman of the gang of workmen who lived at Deir el-Medina. He stands on the prow of the boat used to carry the statue of the goddess Mut. 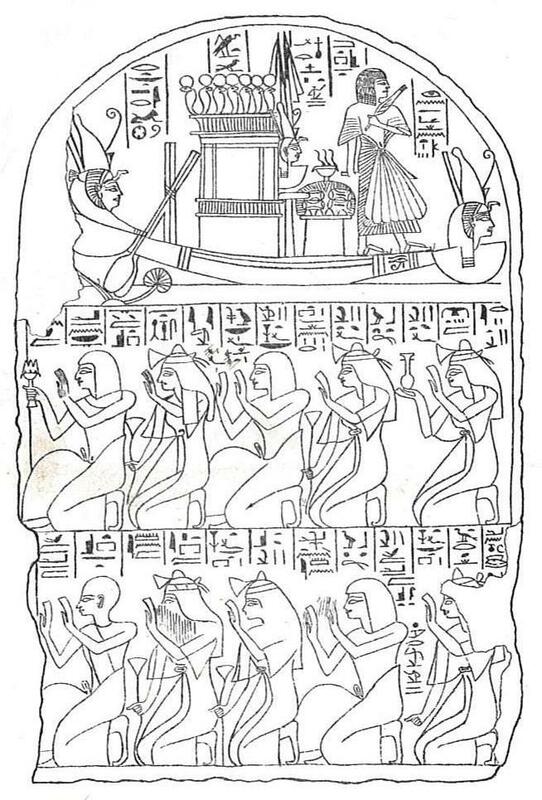 The middle register shows another man, called Hesysunebef, and his family, who are all kneeling in adoration before the foreman Neferhotep. The lower register shows five more people including the parents-in-law of Hesysunebef. After J. Quibell, The Ramesseum, 1898, pl. 10, 3. The inscription on the top register says that the stela was ‘Made by the Chief of the Gang in the Place of Truth (Deir el-Medina), Neferhotep, justified’. Above the shrine of Mut, the hieroglyphs identify the goddess as ‘Mut the Great, Lady of Isheru’ (her temple at Karnak). The hieroglyphs in the middle register caption the figures beneath: ‘[Made/done/praise] by the workman of the Lord of the Two Lands Hesysunebef, justified; his son Neferhotep (ii), his wife, the lady of the house, Huenro, justified; his daughter Webkhet, justified; his daughter, Nubemiry, justified’. The hieroglyphs in the lower register list ‘The workman in the Place of Truth, Amenemope, justified; his wife, the lady of the house, Iset, justified; the temple-singer of Amun, Webkhet, justified; the workman in the Place of Truth, Mery-Re, justified; the lady of the house, Weretanu, [justified]’. Hesysunebef and family. Photo by Oliver Smith. It appears that Neferhotep was the benefactor and adoptive father of Hesysunebef, whose name means ‘He who is praised by his lord’. It is unusual that Neferhotep is depicted standing in the sacred boat (or ‘barque’) of the goddess Mut. Ordinary people were not usually permitted this honour – not even the Pharaoh. At Deir el-Medina the carrying of such a barque in procession would have happened on a fairly regular basis; such priestly duties would have been shared by several workmen. We know from other sources that Hesysunebef appears to have risen to the high rank of Deputy – the second-in-command at the village – although he started life as a slave before his adoption by Neferhotep. Huenro was the wife of Hesysunebef. It is known that Huenro lived with the workman Pendua before she married Hesysunebef, and that she was unfaithful to both men with the infamous chief workman of the gang called Paneb. When he found out, Hesysunebef divorced Huenro in the second year of King Sethnakhte (c. 1190-1187 BC). After her divorce, Huenro was left penniless. She was given charity by one individual in the village who gave her a monthly ration of grain. 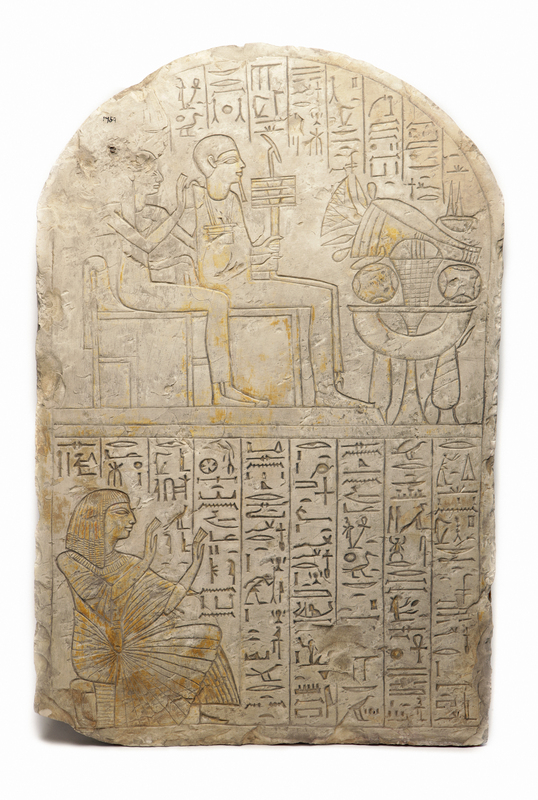 The stela has been subject of pioneering work with interactive technology by Loughborough University. This allows us to tell the stories of these colourful characters in a more comprehensive way than was previously possible.